There are a few destinations in the world, known globally for their spectacular hot air balloon experiences. Cappadocia in Turkey comes to mind, as well as Napa Valley over the wine regions, and the International Balloon Fiesta in Albuquerque, New Mexico. 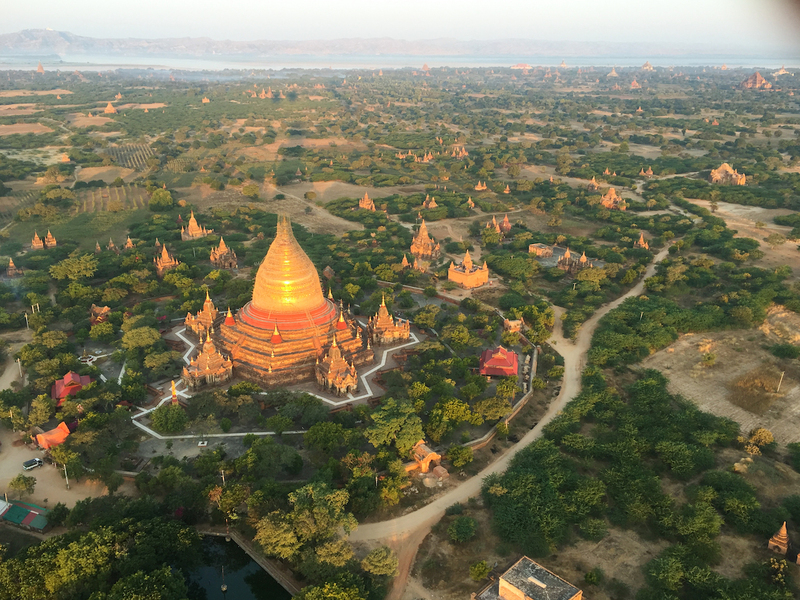 But perhaps the most mystical and exotic of the hot air balloon routes are over the ancient temples of Bagan in Myanmar, where you have a 360 degree view of ancient temples many of which are over a thousand years old. When we were in Bagan, the three hot air balloon companies to choose from were: Balloons Over Bagan (red), Golden Eagle Ballooning (yellow), and Oriental Ballooning (green). From reading reviews online and our own observations, it seems like each company offers the same route and experience without much differentiation. From our research, Balloons Over Bagan seems to be the most well-known, possibly because of it’s mention and cover art appearance in the 12th Edition cover of Lonely Planet! Due to availability, however, we went with Oriental Ballooning, booking our balloon flight at the guesthouse we stayed at. Hot air ballooning is a sell-out activity in Bagan, but also a very costly one. How much? The price was $395USD per person, meaning we spent over $1,000CAD for the two of us, for a 45 minute balloon flight. Trust me, we hemmed and hawed a lot about spending such an exorbitant amount of money in a developing country where wages and the cost of living is so minimal. Once we arrived in Bagan, however, FOMO kicked in. We were on vacation, we had never been in a hot air balloon, if we were going to ever go in a hot air balloon THIS was the location to do it, and (in an ironic justification) the cost of living for everything else was so low in Myanmar, let’s treat ourselves to this. Sidenote: In a country where wages and the cost of living are so minimal, I felt a little bit guilty spending so freely on such a costly experience. I always feel that way when I am indulging in “luxury” experiences (whether it be dining, accommodations, activities, or attractions) in developing countries. 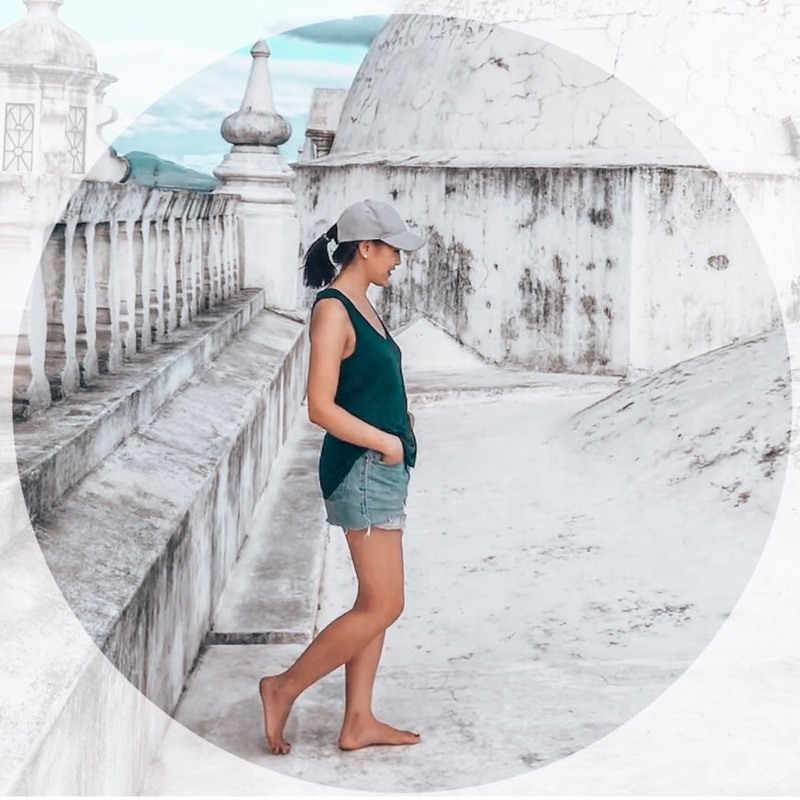 I have not yet found a way to reconcile these feelings but I think the best way might be to just be open to all experiences – from local to luxurious, while being respectful to the local people and cultures as a conscientious tourist. Oriental Ballooning picked us up in a shuttle from our guesthouse in the very early morning it was still dark. While we waited, tea and pastries are served. After a quick briefing, you are assigned to a balloon with a different pilot. All pilots are professionally trained with a commercial UK balloon licence and many years of flying experience. As dawn began to break, the crew inflates the giant balloon with heat, as we stood around and took photos. 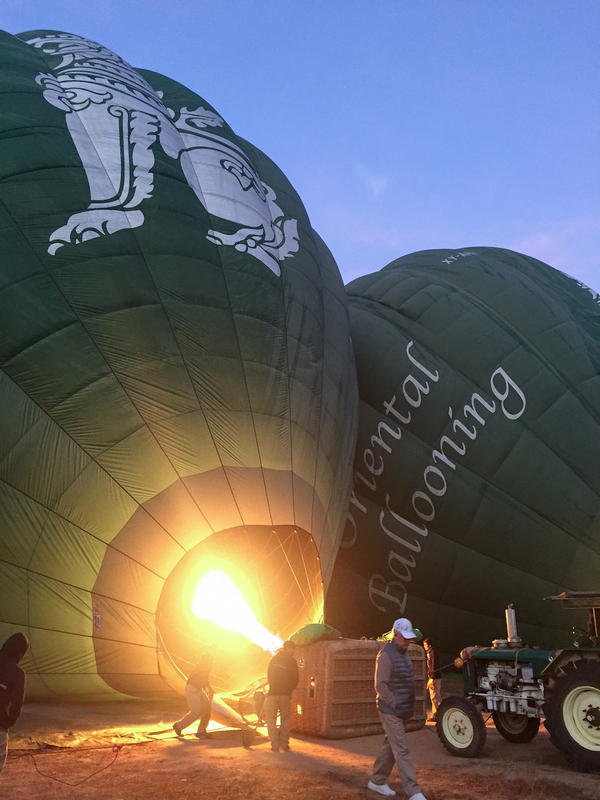 Our entire experience with Oriental Ballooning was well-organized and professional with seamless transitions; the crew has done this hundreds of times before. Our balloon with Oriental Ballooning only had 8 passengers, two in each quadrant of the balloon basket. This means you get a comfortable and relatively spacious ride…but most importantly an unblocked view of the amazing ariel views of Bagan. Research Tip: When you are booking your Bagan hot air balloon experience (or any hot air balloon ride), ask about the number of passengers in each basket. The entire journey was very smooth, and extremely peaceful and serene. The only sound you hear is the air blasting into the balloon above your head. 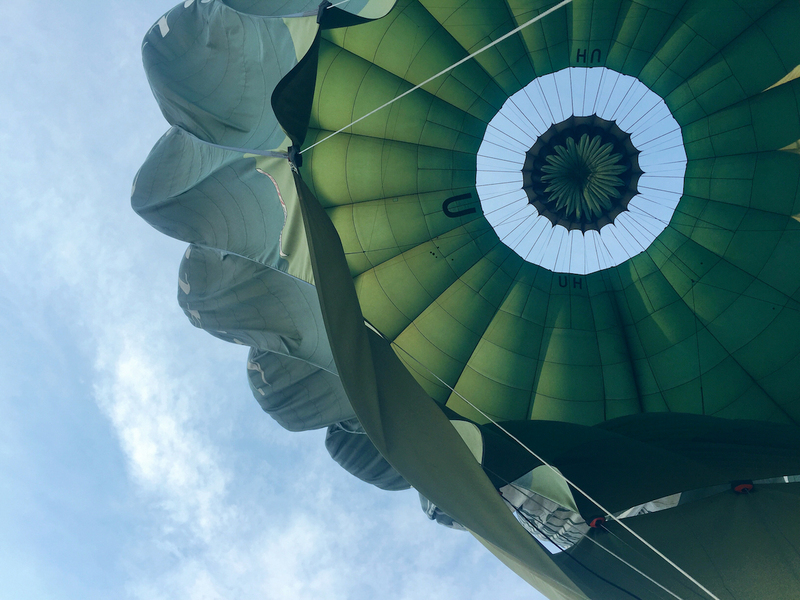 According to our pilot, there’s no way to direct your balloon in a certain direction, you can only control the elevation of the balloon with heat, and catch different air currents to naturally steer the balloon. As our balloon slowly turned in the sky, we suddenly saw the sunrise peeking over the horizon, and it was majestically beautiful. 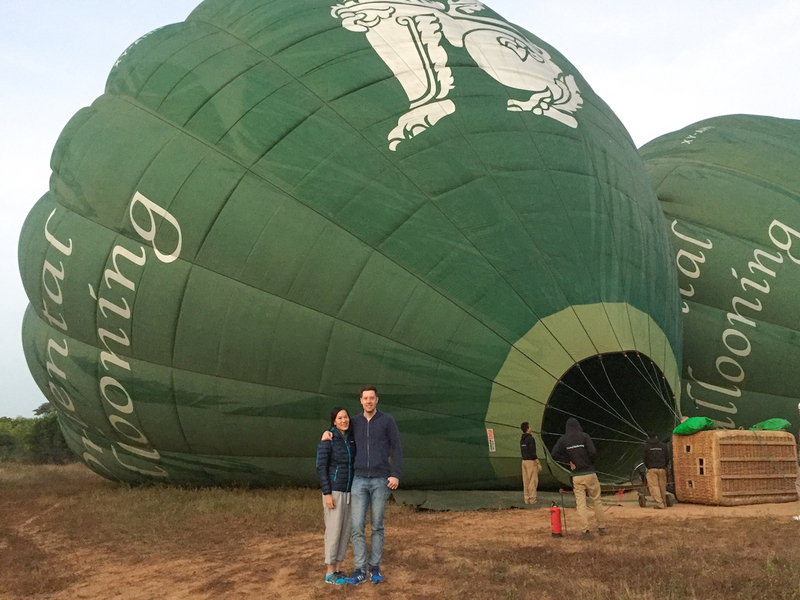 Was ballooning in Bagan worth it? I was 100% satisfied on our first hot air balloon ride, I have no regrets on splurging on this experience. However, if you are a budget backpacker, there are MANY other ways to see the temples Bagan including renting a taxi or biking. And you can always catch the sunrise/sunset from the roof of the temple – we waved at some early rises watching the sunrise on the temples as we flew by them! Was the hot air balloon ride scary? 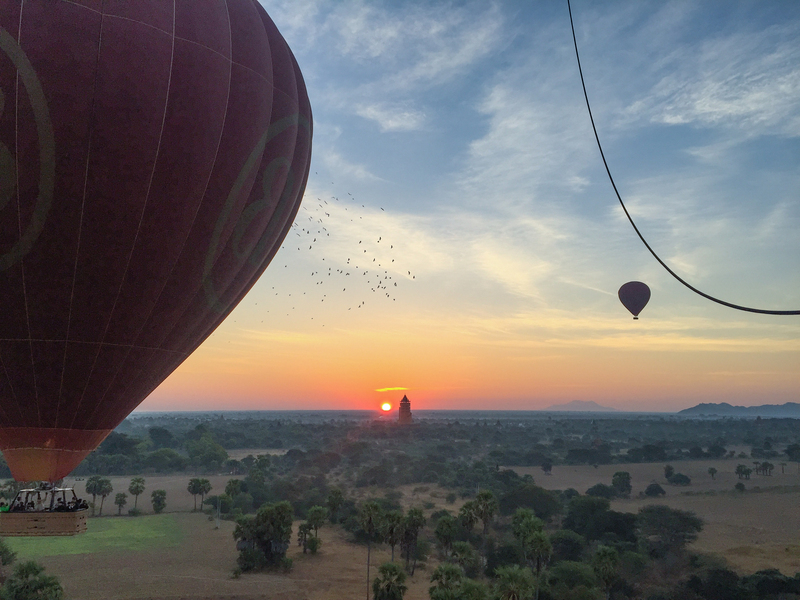 When I tell people about taking a hot air balloon ride in Bagan, I am surprised at how often people asked me if it was scary, or immediately ruled this experience out for themselves because of a fear of flying. To be honest, the “scary” factor didn’t even cross my mind. The whole ride was very gentle (a small bump upon landing), the basket went up to my chest so I didn’t feel like I would fall out, and the weather conditions were very peaceful. There is no lurchiness or dropping of your stomach. At no point during the entire experience did I ever feel sketched out or that my safety was compromised. Was the hot air balloon ride safe? All pilots are professionally trained with a commercial UK balloon licence and many years of flying experience. From reading over reviews, if there are any weather conditions which may compromise the safety of the balloon ride, the flight is canceled and you are given a refund. Disappointing, yes, but that is how seriously the companies take your safety. 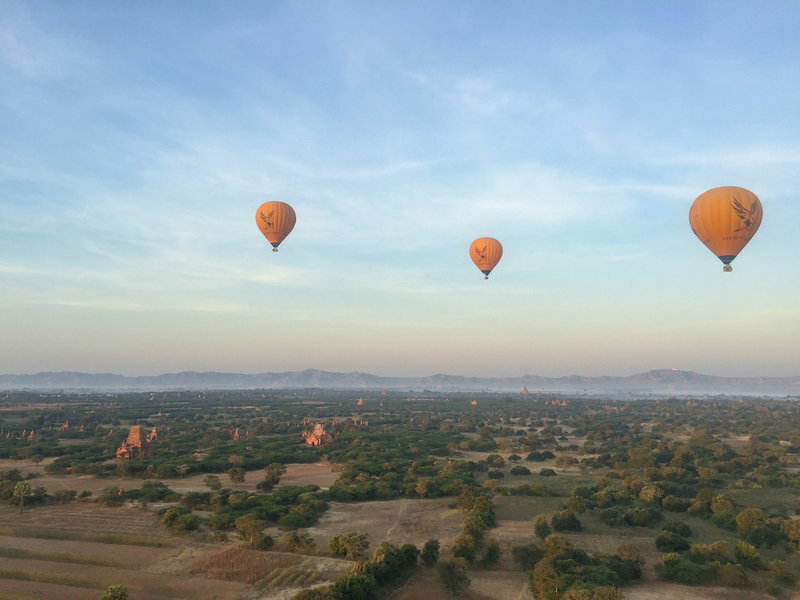 Should I book the Bagan balloon ride in advance? Yes. We were hemming and hawing, and didn’t know the exact dates we would be in Bagan, so we waited. If you know you are going to do this, best to book in advance. We were fortunate we got a seat! Blue skies in Bagan after our landing and the balloon began to deflate. 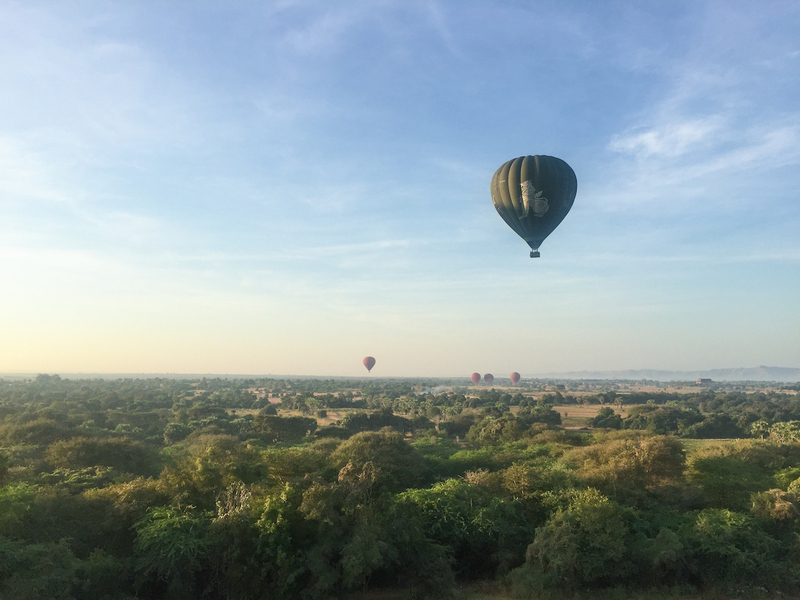 If you have any questions about our Bagan balloon ride, feel free to leave a comment below! We were in Bagan, Myanmar, in January 2017 and booked our hot air balloon ride with Oriental Ballooning at $395USD per person. This is amazing, the view from above looks so amazing. I wish one day i can book it and experience it. I’ve always wanted to go on a hot air balloon. They look so beautiful in the sky. This adventure looks like an absolute blast! I’ll have to add hot air ballooning to my travel bucketlist! Oh, really detailed guide. I can find out what I’m curious here in your post. Thanks for your sharing!